CARP Liberia organizes TOP GUN workshop! On June 15, 2016, CARP Liberia hosted a “Top Gun” leadership workshop in Gbarnga, Bong County. The “Top Gun” leadership workshop was created in 2015 to gather the top students and train them to become global citizens. The first workshop was hosted in South Korea and gathered around 190 international youth. CARP-Liberia President, Fofee B.W. Siryon, attended “Top Gun” and was very inspired. He returned to Liberia and organized a similar program for the youth in his country. Siryon explained that the training workshop gave young Liberians the necessary tools and resources to change society. The program included a 2-day intensive training for core leaders from two of the major universities in Gbarnga. 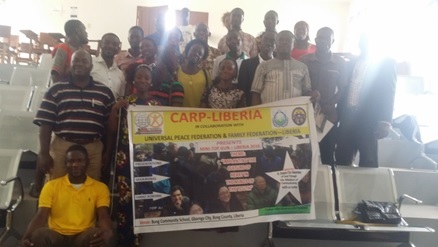 CARP-Liberia seeks to revitalize young people’s relationship with God, generate their spirit of compassion, involvement, and determination, and invest in the next generation’s career development. The three major goals of CARP-Liberia are: spiritual renewal, new moral commitment, and positive solutions to global injustice. Local leaders were recently elected to lead the activities of CARP Chapters at Cuttington University (CU) and the Bong County Technical College (BCTC). Pastor Abraham, who was elected to lead the Cuttington University CARP chapter, said, “CARP’s goals and aspirations, which has to do with the spirit of God, motivated me to quickly join and take the message forward. To build a nation, one has to give their life. Hence I will do all that I can to recruit as many students as possible to form part of the international organization to reach to others.” Abraham shared that his goal is to recruit about 300 members from Cuttington University alone. President Fofee shared about plans to launch a High School Peace Club which focuses on character education. This club will aim to help students with their studies, career choices, and public speaking skills. Upon returning from the workshop, many inspired participants shared about the vision and core values of CARP with their peers. With such a positive response, many High School Peace Club members are eager to be a part of local CARP chapters one day. President Fofee is currently working on registering chapters as official organizations and being recognized on campus by the school administration. CARP Liberia is confident and hopeful in their positive impact on the lives of those at school, in the community, the nation, and the world at large. Older Post10 Reasons to Sign-Up for Global Momentum 2016!